Whether you are interested in researching your family history or not, you have stories, family mementos and photographs in your home, some that have been passed down, generation to generation. This talk will give you an awareness of what you can do to ensure your family treasures are available for your descendants. This is the description of a lecture that California Genealogical Society President Jane Knowles Lindsey keeps in her back pocket. Well, not literally, but it's ready when the opportunity presents itself as it did recently when she was having a conversation with a new member. As Janiece Nolan tells it, "I just mentioned I had Rotary meeting right after I met Jane for first time and she asked if she could speak sometime and I said sure." Janiece Nolan, Steven Shagrin and Jane Lindsey. 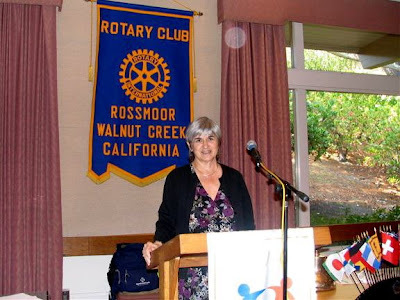 Janiece is a long-time member of The Rotary Club of Rossmoor. 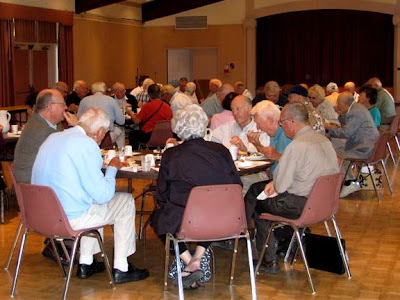 The group meets every Wednesday at the Hillside Club House for a social hour, lunch and a speaker. Janiece made the arrangements with Rossmoor Rotary President Steven Shagrin and Jane spoke to them this week on Wednesday, September 10, 2008. 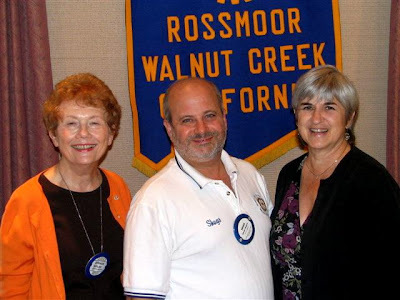 The Rossmoor group is the largest Rotary Club in the area, and among the most active. They have 75 members who are retired, semi-retired or are local business people from the surrounding community. Many in the audience were in the special position of remembering their grandparents and also having children and grandchildren of their own. As Jane pointed out, they possess knowledge of five generations - valuable genealogical information, even if they had never thought of it in those terms. You may not be interested in genealogical research but you may hold the key to help others unlock family mysteries. Lindsey told members that even if spending time in a library or at a computer researching their ancestry doesn't appeal to them, there are simple things they can do to help forward the research of others, and more importantly, to pass down all that precious family information to their descendants. Jane had several specific things that audience members could do but I won't disclose them here - you'll have to schedule her talk for your own group to learn the specifics. What I can give you is Janiece Nolan's report: "Everyone enjoyed Jane's talk and there were many questions and comments. People came up to Jane afterward to ask about CGS and express their appreciation." Jane Knowles Lindsey, a native of Massachusetts, received her R.N. degree from Boston University and practiced nursing until 1983. She is a past trustee and council member for the New England Historical and Genealogical Society and is president of the California Genealogical Society and serves on its board of directors. Under her capable leadership, CGS membership has grown and its circle of activities has been significantly enlarged. Jane's specialty is events planning. She has arranged genealogical research cruises to Alaska, Canada and the Caribbean. In addition, she leads annual group research tours to major genealogical libraries in Salt Lake City, Boston and Fort Wayne, Indiana. If your group is interested in hearing "Genealogy is Not Just for Genealogists" or another talk related to genealogy, please contact the society at 510-663-1358. I've nominated your blog for the "I Heart Your Blog" award! See http://www.littlebytesoflife.com/2008/09/sharing-heart-i-mean-love.html. Thanks, Elizabeth! I heart your blog too! Too bad California is so far from Florida. I'd like to hear he speak.